Gluten Free - How Do I Go Without Wheat? 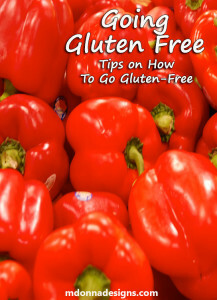 Mdonnadesigns Simple Living, Gluten Free Diet, Frugal Life > Going Gluten Free: How Do I Do It? Going Gluten Free: How Do I Do It? Are you going gluten free? If you have celiac disease, a gluten sensitivity or a wheat allergy, avoiding these ingredients is a necessity. But changing your entire diet is never as easy as it sounds. But if you are prepared, you have already solved half the problem. So How Do You Go Gluten Free? Going gluten free can seem complicated, but it’s easier than you may think. The first step is to decide whether you are avoiding gluten altogether or whether you are just avoiding wheat. People who have celiac disease or a gluten sensitivity must avoid all gluten, but people with a wheat allergy only need to avoid wheat. For more information, see our article discussing the difference between wheat-free foods and gluten-free foods. As you begin to remove gluten (or wheat) from your diet, it’s easier to just stick with the basics. Begin with fresh fruits and vegetables, meats, etc. One of my favorites is simply sauteed squash. It’s simple and it tastes good. * While it may seem obvious, it’s always best to repeat: Avoid foods to which you are allergic. Most of your safe foods will be located around the perimeter of the grocery store. For the first few weeks, try to avoid the center aisles. In those aisles, you will find pre-packaged foods, which are generally loaded with wheat and gluten. Honestly, they probably aren’t very healthy anyway. Before long, you will want to move past the basics. You might be craving al dente pasta or chewy chocolate brownies. But don’t be tempted to go back to your old ways. The truth is that gluten-free food isn’t as bad as it sounds. I know, you’re skeptical, but here’s a funny story that might change your mind. This past March, my friends and I took our girls to Myrtle Beach for Spring Break. We had a beautiful hotel room with an amazing view and a small kitchenette. I brought two batches of brownies to share. A large batch of regular brownies for everyone else and my special gluten-free brownies for me to eat. Everyone else was a little curious, so one by one, they decided to brave it out and taste-test the regular mix brownie against the gluten-free mix brownie. And believe it or not, it was a 6 out of 6 victory. The gluten-free brownies won hands-down. It just goes to show you (me) that things aren’t always as they seem. So before you get all crazy and go back to the old wheat brownie mix (that will make you sick, btw), remember that there are some great choices in gluten-free foods. And yes, I’ve taken it upon myself to get down in the trenches and taste test some of them. And in other cases, invent recipes. So don’t give up. Get back on the horse and try again. The moral of the story is… Don’t be nervous about walking down the Health Food section in your local grocery store, or stopping by a specialty store or gluten-free shop. You may even be surprised by the number of safe foods in the regular aisle of the grocery store. “Safe” specialty foods include a wide variety of options from cous cous to bouillon cubes to baked goods. I have tried quite a few of these products, and I have mostly been pleased with the results. Don’t get me wrong, there have been some cases where the food has been just plain awful. But for the most part, I have been quite impressed with the results. You might be pleasantly surprised. In other articles, I’ll review the products that I have enjoyed, and offer my opinion of the flavor and texture of each. Luckily, avoiding dangerous foods is easier than you may think. The good news is that products displaying the “gluten-free” claim are regulated by the Food and Drug Administration as of August 2, 2013. Any product that bears the label “gluten-free” must contain less than 20 ppm of gluten. The FDA also regulates ingredients that are part of the 8 major food allergens including wheat. However, my experience shows that it can be dangerous to skip to the bottom where it says “This product may contain eggs or soy.” It is very important to read every ingredient on the label. You may ask, What exactly is my experience? I am the mother of two children with life-threatening food allergies, and both my husband and myself have food allergies as well. We have been avid label readers for about 20 years, and yes, it was very difficult in the beginning. But you live and you learn, and it becomes a part of your life. My strongest piece of advice is trust no one. If you don’t make it yourself, watch it being made or open the package yourself (after reading the label yourself), then don’t bet your life on it. Read every ingredient. Verify all information including anything you read on this site. Always read labels. Always.